There’s no way it’s been a year since my Granny died. I don’t know for sure except that my cousin reminded me on the day her sister’s baby was born a few weeks ago; I had blocked out the date and most of the weeks following entirely and only knew it was some time in October. Sure enough, once I pulled the funeral programme from the folder of materials I used to give the eulogy, the date was right there printed on the front: 10.21.14. It flabbergasts me that it’s been a year, but I’m also glad I’m to the point where I’m having happy dreams about her as opposed to sad dreams I wake up crying from. I still selfishly wish–and would give many things–for the chance to say goodbye. But I remind myself that many people aren’t given that chance, and that bedside goodbyes usually only happen in movies and/or when someone is very ill and in a lot of pain. Granny died peacefully and I need to be happy for that. I said I wasn’t going to blog for awhile, and I still have no intentions of doing so regularly. 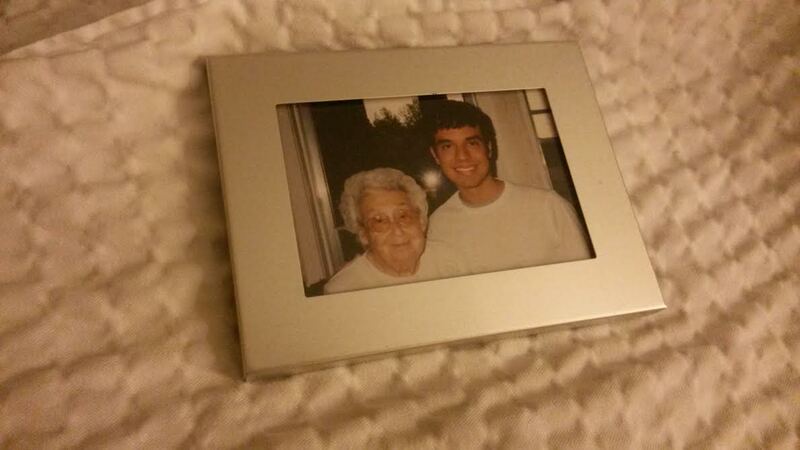 I also have no intentions of sharing any personal photos, except the one above is a snapshot of a photo of me and Granny from probably 2002. If anyone steals *that* one, then they’re just desperate and despicable…it’s a snapshot in poor lighting of a framed photo laying on my bedspread. Anyway, I was thinking back to many of the special one-on-one times I spent with my Granny. I went up to her house once when I was enrolled in a Women’s Studies class–appropriately entitled “The Myth of Southern Womanhood”–and she told me all about patchwork quilting and how she had done it for so many years. It still brings tears to my eyes, mainly because I would’ve never had that conversation with her were it not for that silly class. She even gave me a scrap of quilt bordered in rick rack ribbon (she called it a potholder) which I did a sort of raffle for during the presentation in my class, and I made whomever won it promise to take care of the “scrap” because my Granny made it with tender loving care (she was losing her eyesight by that point and couldn’t sew full-sized quilts any longer). Again, the myth of Southern womanhood at work…that scrap of quilt represented more than the material it was made of, and I was glad to share it with some random member of my class. When my father and my aunt and I were cleaning up my Granny’s house after she moved into the retirement home, we found another old quilt she’d made and I took it to the retirement home to show her. It wasn’t patchwork, but made with pieces of store-bought, printed fabric which apparently she herself didn’t value as much. She took a look at it and responded, “Oh, that’ll be good for throwing over some plants in the winter out on the porch.” I was appalled and asked her if I could just keep it instead. She said of course, and then she kept it temporarily herself and had one of the ladies down the hall from her wash it and sew a new grosgrain ribbon border around it. I have it here with me in Las Vegas now and pull it out during the winter and put it over my bed, as opposed to plants out on the porch. There’s a lot of things I wish I could change about my relationship with my Granny. But it’s just that…wishful thinking, and all the therapy I’ve undergone has taught me not to entertain those ideas. And apparently she’s gone, though I still do find that hard to believe. There’s a lot she didn’t know about me, and perhaps it’s all for the better. I still miss her an awful lot and it’s hard to go home knowing I won’t be visiting her. She taught me how to play Chinese Checkers on the oval braided rug covering her beautiful hardwood living room floor. I’d also give anything to have that old, cardboard Chinese Checkers board; I see similar ones all the time in antique stores for $50+. Not that I’d buy another one and not that I’d sell hers if I had it, mind you. Life is a lot like that vintage, cardboard Chinese Checkers board in that you don’t know what you got ’til it’s gone, as the song goes. I knew my Granny was special and I knew I’d miss her, but I also foolishly always thought I’d get to say goodbye to her. That’s something I need to get over and I realize it. I’m 34 going on 35 and was blessed to have her for a very long time–twice as long as my Nana, 10 years longer than my Pop-Pop, and I never did know my Granddaddy (my Granny’s husband). With that, I’ll end here. I miss you, Granny. And you are still here, in my heart and many others. You’re very much still here.